I was a vegetarian for almost 2 years. I didn't have intensive knowledge on what to eat. I am now a vegetarian/pescetarian , I eat seafood occasionally. When you are a vegetarian , you must have the right amount of protein daily. 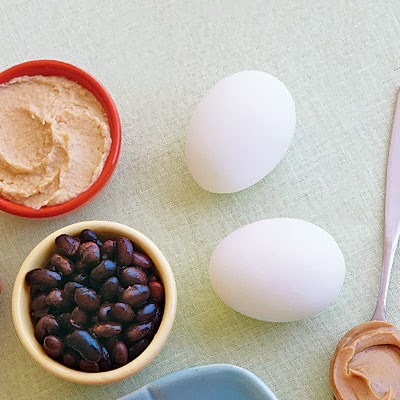 Here are the 10 high protein foods. Cottage cheese serves as great snack. It’s affordable, comes in reduced-fat versions, and also contains calcium to keep your bones strong. But you can also hide it in creamy dishes, or sub it out for ricotta cheese or sour cream in certain dishes too. Try combining with fresh veggies for a savory treat, or adding fruit and cinnamon for something more sweet. While all soy, including tofu and soybeans, are excellent sources of protein, soy milk is convenient and versatile, making it the perfect thing to have around. In addition, some brands offer options that are fortifed with extra calcium. Chocolate flavors are available for when your sweet tooth strikes, vanilla is great in cereal and coffee, and original is a great substitute for baked goods and smoothies. Greek yogurt packs as much as double the protein as regular yogurt. It’s also thick, filling, tart, and less sweet than some regular varieties, all while staying in the low-calorie range. It’s great on its own, with fruit, or as a substitute for sour cream. Bring back this crunchy or creamy childhood favorite by spreading peanut butter on toast instead of butter for more protein to your morning routine. Also try using it in smoothies and baked goods, or just keep some stashed away with a package of whole-wheat crackers for when you belly is rumbling. Start your day off right with protein-packed eggs. This will give your morning a boost and fuel you until lunch. Cooking with eggs brings breakfast to a whole new level. Mix it up a bit with omelets and quiche or try cooking eggs scrambled, poached, hard-boiled, or sunny-side-up. Go nuts over almonds – the monounsaturated fats they contain have been shown to reduce heart disease. A serving size is about one handful of almonds, or 2 tablespoons of almond butter. Try sliced almonds on top of salads or create your own spice recipe to liven them up a bit. Seitan, AKA wheat-meat, is hailed by vegetarians because of its substantial texture and high protein. Unlike tofu, seitan is a meat substitute that mocks the texture of chicken, making it ideal for sandwiches, soups, or anywhere you would traditionally use meat. Made from wheat gluten, seitan may not be sold in all grocery stores, so stock up at specialty markets, or make a batch from a recipe like this. Dried black beans, kidney beans, lentils, chickpeas, and pinto beans are all delicious choices for low-fat, fiber-filled protein. Using dried beans allows you to control the sodium and additives that go into the dish. Soak dried beans overnight in a large bowl of water, rinse until the water runs clean, then simmer for 2 hours on medium/low heat to enjoy. Spice with cumin, garlic, red pepper, or other spices. Also known as pepitas, pumpkin seeds are a great grab-and-go snack or topping for salads and soups. While they are available year-round in stores, you can roast fresh seeds at home in fall, when pumpkins come into season. Nuts and seeds can be high in calories and fat so be mindful of your serving sizes.